There are few moments in life that leave us truly speechless, but we offer a creative way to express your affection without even uttering a word. Our polished black titanium “only love you” ring for men provides the perfect dose of masculinity and sentimentality in one sleek and sophisticated package. Finding a soulmate is no easy task, so you should celebrate with a ring that explains exactly how you feel. We designed this fashion ring with a heartfelt “only love you” inscription in script font, which is timeless and will remind you of the special bond you share with your boyfriend, husband, partner, or soon-to-be-spouse. 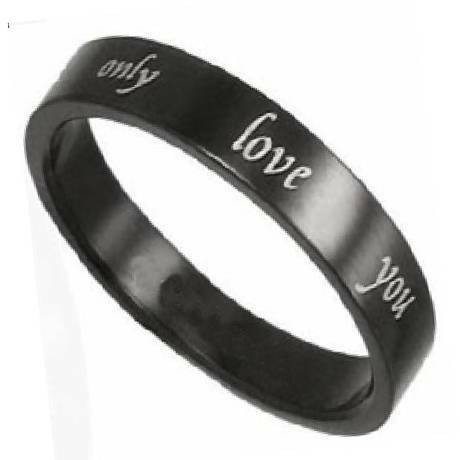 Our 6mm polished black titanium “only love you” ring for men certainly exudes the dark and brooding bad-boy appeal. We offer a variety of sizes, ranging from eight to 16. 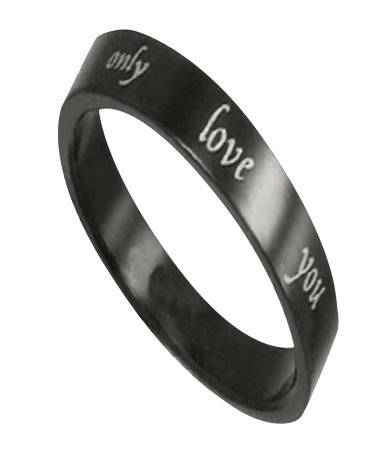 Capture the way you feel in words by choosing our polished black titanium “only love you” ring for men. The striking 6mm band provides the perfect canvas on which you can show off your adoration and devotion. This designer ring features a traditional fit and the highest strength-to-weight ratio of any transition metals. Titanium is beloved by grooms of all ages, because of its superior resistance to denting, discoloring, and scratching. Titanium never loses its shine and will have you grinning from ear to ear each time to glance down to take a peek. We recommend that you have your finger sized by a professional jeweler to ensure that a traditional fit is right for you and your lifestyle. If you have any questions about our 6mm polished black titanium “only love you” ring for men, please feel free to contact us today for further assistance. I bought this ring in size 15 and it fit him perfectly. Shipping was faster than I expected and the ring looks very professional. I disliked that it did NOT come with a ring box, which was odd. Something to keep in mind before purchasing last minute.